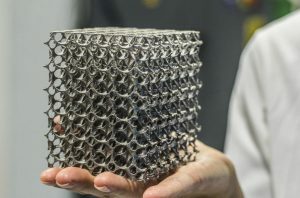 While plastic-based materials have been utilised for the majority of additive manufacturing projects since the technology’s inception, recent developments in metal printing materials mean that producing functional metal parts is now not only feasible, but worthy of serious consideration for a range of industries. The possibility of using additive manufacturing techniques to deliver parts with the same mechanical qualities as their machined counterparts has helped open the door to using this technology for production, as well as prototyping, something that forward-thinking companies have already begun exploring. In this tutorial, we will offer an overview of the key things to consider for any project involving the direct metal laser sintering process and its potential applications across the additive manufacturing industry. Direct metal laser sintering is a method of additive manufacturing that involves blasting a bed of metal powder with a fine laser, fusing the powder together one layer at a time to create the finished part or prototype, which can then be machined and finished in the same way as one produced by CNC. Since its introduction in the early nineties, the process has been used to produce a wide range of prototypes and functional parts across the automotive, aerospace and medical/dental industries. DMLS offers a dependable way to deliver quality metal components in short production runs. The process is incredibly consistent, with minimal shrinkage during post-printing cooling, and resulting mechanical values that can often exceed the machined equivalents. Compared to CNC methods, DMLS reduces the typical material wastage by as much as 90%. DMLS also offer a lot of flexibility, as parts can be further refined after printing using more traditional CNC methods, and even welded like regular metals. This includes engraving or embossing details, which has led a number of jewellery designers to explore the possibilities offered by DMLS. However, the process for 3D printing metal in this way is still relatively young compared to other methods, and as such, is not without its disadvantages. The process is still currently limited to industrial applications due to its relative complexity, with the choice of materials still relatively limited at the time of writing. Furthermore, the process is still unsuitable for especially large projects, due to the available printers’ limited build space. What materials can be printed in this way? What post-processing will be required? First of all, any DMLS print will need to have any support elements removed, which is often a quite time-consuming process, so factor this into your project timelines. Typical machining techniques can be used for this purpose. The finishes produced by direct metal laser sintering are inherently rough and grainy, which means that polishing will be required to deliver a smooth, attractive finish, especially if the part is to be used for casting later. Electro-polishing is an effective option in this regard, significantly improving the overall quality of a part’s finish by minimising roughness, so less dirt adheres to it. As no machining is involved, this is an especially attractive option for for parts with fragile elements that could be damaged by machining techniques. Certain metallic powders used for additive manufacturing can have their mechanical properties considerably improved by heat treatment after printing. The specification sheets for these materials should list their pre- and post-treatment properties. As with any additive manufacturing project, consider your volume packing requirements at the earliest opportunity. For most DMLS projects, printing multiple units at one will reduce costs, although when determining how many units can be printed simultaneously with your available machines, be sure to consider the part orientation, as this is typically the biggest challenge when printing metal parts. Metal parts require far more specific orientation than plastic ones due to the support structures that will be necessary during printing, so volume packing must be planned around this consideration. Doing this will help achieve a sensible balance between material costs, quality and overall build time.